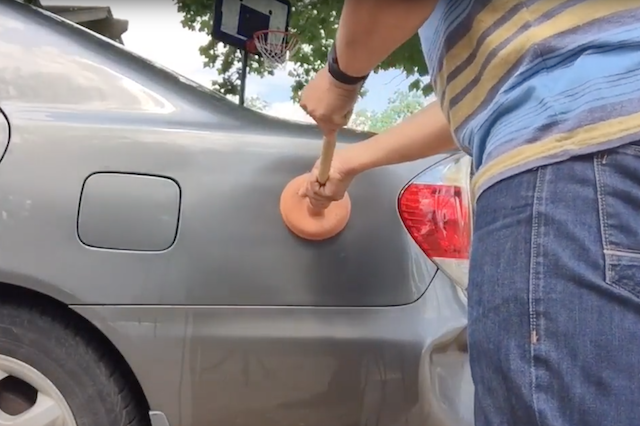 This video demonstrates how you can save yourself a lot of money by removing dents yourself from your car, with a handy 'life hack'. In the video, a man can be seen pouring boiling water over the dent in the bodywork. After doing this he takes a sink plunger and gently pulls the metal out. Although the dent is removed the trick doesn't get rid of any scrapes, but does appear to take the panel back to its original shape without cracking the paintwork. The next stage is removing a dent in the plastic bumper. This clearly proves trickier and doesn't fully remove the entire dent. He can be seen pouring boiling water over the plastic before reaching up inside the bumper and manually pushing the dent out with his hands rather than using a plunger.